Two photographs of a young Oakland welder who became a civil rights hero were unveiled in the Smithsonian's National Portrait Gallery this morning. Fred Korematsu was 23 years old in 1942 when he, like all other Japanese Americans on the West Coast, was ordered to report for internment. Korematsu refused, and was eventually arrested, convicted, and forced into the camps. A federal court reversed his conviction more than 40 years later, giving new energy to a movement that culminated in a government apology and reparations for the internees. 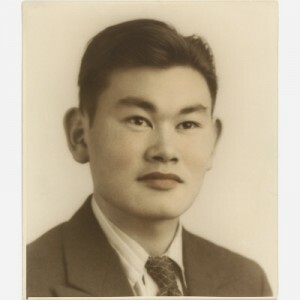 Korematsu himself received the Presidential Medal of Freedom in 1998 and remained a civil liberties activist, particularly advocating for Muslim Americans in the wake of the 9/11 attacks, until his death in 2005. The state of California now celebrates January 30 as Fred Korematsu Day. These are original photos from the 1940’s that were hand-tinted, as many photos were in that day. 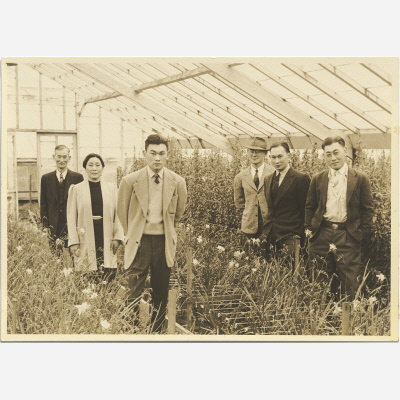 One is a head shot of Mr. Korematsu at about the age of 20, and the other is a photo of Fred at about the same age with his family, and they’re standing in their flower nursery in East Oakland. And this shows some of the context of the story; the family had to abandon this nursery that they had worked so hard to build when Executive Order 9066 came down and all Japanese Americans had to report to the camps. Fred, of course, initially refused to go, but the rest of the family went immediately, and they suffered tremendously, in terms of personal dignity and in terms of economics. My understanding is that when they got back from the camps years later, the nursery was completely trashed. The Korematsu story is well-known within the Asian-American community, and there are exhibits commemorating his contributions at the Japanese American National Museum in Los Angeles, the National Japanese American Historical Society, and the educational displays at the sites of the Manzanar and Heart Mountain camps. But Liu hopes the exhibit at the Smithsonian will bring it to a whole new audience. Having Fred Korematsu’s portrait in this very prestigious exhibition helps show a more complete picture of American history. There are many heroes, even other Asian-American heroes, from the civil rights movement whose stories merit us telling and teaching to students. But Fred is an ambassador from this moment in history. And his story humanizes this moment in history in a way even a five-year-old can understand. A five-year-old can understand this: there was a man named Fred Korematsu who didn't want to go to this camp, because it just wasn't fair. Korematsu’s daughter Karen was interviewed recently by NPR’s Talk of the Nation and by the San Francisco Chronicle.